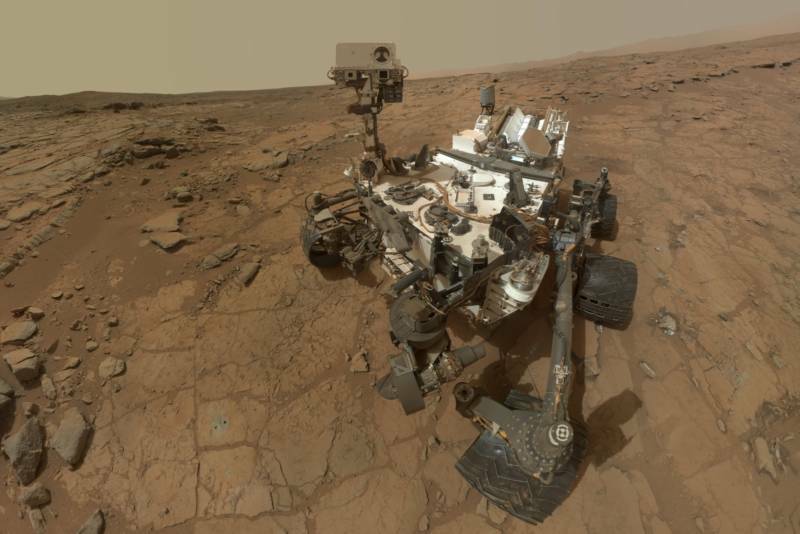 NASA's Mars Science Laboratory, the rover Curiosity, has dug up a surprise from the rocks of Mars, one that poses a vexing puzzle to scientists. 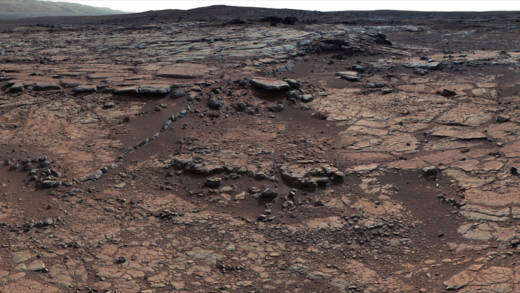 A conspicuous lack of carbonate minerals in the sedimentary rocks of Gale Crater is challenging modern theories for how Mars' early environment could have been warm enough to support liquid water. Today, Mars' atmosphere is too thin for water to exist in a liquid state for long. Atmospheric pressure at Mars' surface is only a hundredth that of Earth, making Mars a cold, dry desert. Wind-swept landscapes streaked by dust-devils and punctuated by a seasonal global dust storm constitute most of the action to be found on Mars today. It is in this desolate setting that Curiosity landed in August 2012, lowered to the floor of Gale Crater by a rocket-propelled winch system. Its mission goal was simple: to investigate whether Mars' environment ever supported liquid surface water, a vital ingredient for the formation of life as we understand it. Gale Crater was chosen as a good site for the rover to search for evidence of that warmer, wetter past. Not only was the 96-mile wide impact basin a possible ancient lake bed, but a mountain of sediment at its center—Mount Sharp--presented an accessible index of Mars' past, its sedimentary layers like the pages of a book spanning billions of years of Mars' geologic history. In the nearly 5 years since landing in the bottom-lands of the dry lake bed, Curiosity has driven over 10.1 miles and climbed a vertical distance of about 600 feet. Along the way, it has found ample signs of the existence of the ancient lake, including water-formed minerals, stream beds, dry deltas, and layer upon layer of sediments from the lake's muddy floor. An abundance of evidence from numerous missions to Mars tell us that in its youth Mars possessed a thicker atmosphere and a robust water cycle, perhaps not unlike Earth's, with precipitation, vast river networks, lakes, and seas. But coming up with an explanation for how Mars was warm enough to support liquid water has been a challenge for scientists. Adding to the challenge, billions of years ago when the planet's waters were flowing, the young sun did not burn so brightly, shedding only two-thirds the solar energy that it does today. So, it may not be enough merely that Mars' atmosphere was once thicker. Some other factor had to be involved to keep the waters from freezing. A leading theory has been that the early Martian atmosphere contained a lot of carbon dioxide, the "greenhouse gas" responsible for heating Venus' atmosphere to oven-like temperatures and saving Earth from total glaciation. A greenhouse gas traps solar energy in the form of heat, acting like an insulating blanket for a planet that would otherwise be colder. Not quite, according to measurements made by the Curiosity rover's "CheMin" instrument. An abundance of carbon dioxide in Mars' early atmosphere, interacting with other chemicals in the Martian waters, would have produced carbonate minerals, which should have been deposited in the sediments of bodies of water like the lake bed of Gale Crater. Curiosity has been looking for those carbonates, but turned up nil. 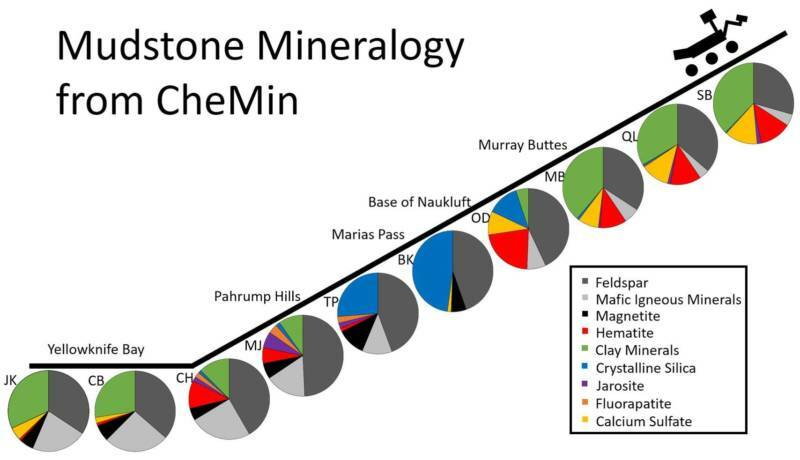 The lack of detection of carbonates implies that there was at best a trace of carbon dioxide in Mars' early atmosphere. To thaw Mars' water ice, there would need to have been at least a hundred times that amount, which would have produced ample quantities of carbonates for Curiosity's CheMin to detect. 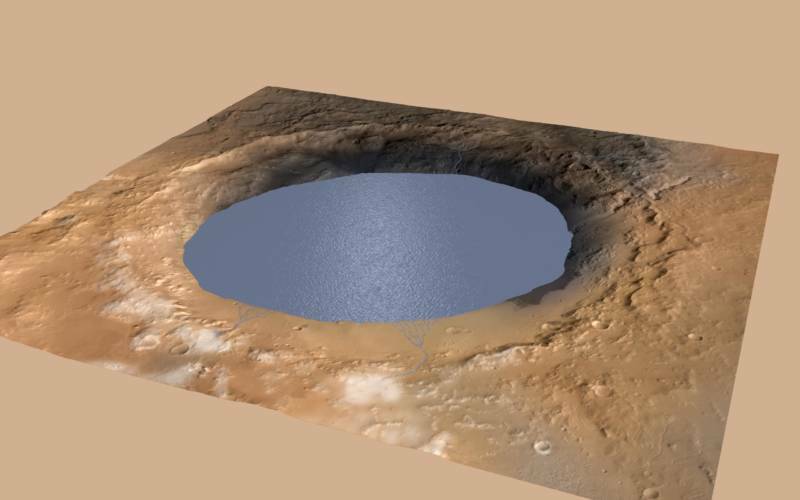 Other theories exist, such as that the waters of the lake in Gale Crater were once topped with a layer of ice. But so far evidence of an ice cover has not been found. Mars has always posed great mysteries to human curiosity and science, and continues to deliver them even today. Certainly, the apparent mismatch of evidence between a wet Mars with a robust water cycle and a Mars too cold to support it is compelling scientists to seek other explanations. Further exploration may help solve this puzzle. Though Curiosity is showing signs of wear and tear from its mountain climbing endeavor, such as holes in the thin tread of its aluminum wheels, the mission continues to roll onward and upward. As Curiosity reaches ever higher and younger sediments, a clearer picture of Mars' watery past should develop.